Catholic parents protesting at the headquarters of the Archdiocese of Detroit. 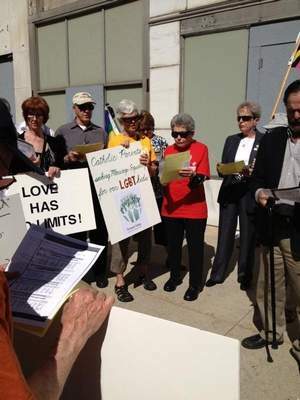 Detroit Archbishop Allen Vigneron’s suggestion that Catholics who support marriage equality in his diocese should not receive communion has sparked a protest led by Catholic parents of LGBT people. “. . . supporters of gay Catholics gathered for a prayer vigil in front of the Archdiocese of Detroit’s chancery headquarters. . . .
“About 25 people sang, ‘All are welcome in this place,’ and marched with rainbow flags in front of the downtown chancery building, saying they had gay relatives and friends. “Mary Ellen Lopata, who is the co-founder and on the board of directors of Fortunate Families, said it’s a ‘sad situation’ that many children have left the Catholic church over its lack of acceptance of gays and lesbians. ” ‘We encourage people to speak up, because the bishops don’t know our children and they need to hear our children, and understand that our children are every bit as whole and holy,’ Lopata said. 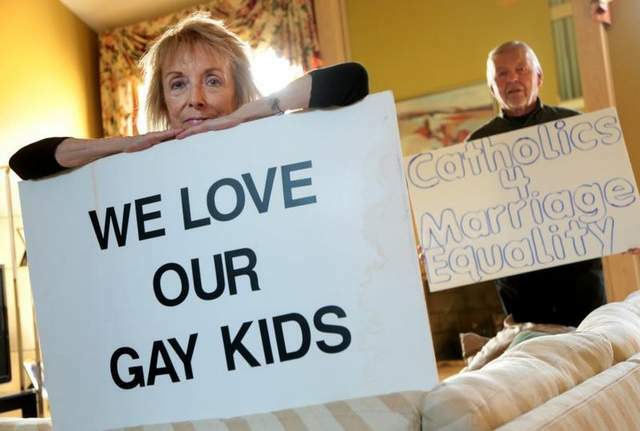 Parents of LGBT people are some of the strongest justice and equality advocates in the Catholic Church. They love both their children and the church, and they are not willing to let their be animosity between these groups. Catholic parents of LGBT people have had to go on a journey of understanding, acceptance, and love, and, as a result, they have a LOT that they can teach the rest of the church about understanding, accepting, and loving LGBT people. About the time of our electioin to legailze marriage equality, i shared with my pastor that my anger with the bishops in opposition to it was consuming me. He told me i must let the anger go. I now find it easier, more peaceful and hopeful to just ignore them. Well, what do you know. I’m thinking that priests who abuse children, bishops and archbishops who allow this to continue to happen – yes Bishop Finn and Archbishop Meyers I’m talking to you, bishops who drive drunk, hit someone and then flee… yes, Bishop McManus, I’m afraid it is you that I am looking at now. I’m thinking that maybe they should not be giving out communion instead of denying communion. (in fairness, i have no idea of McManus’ track record on any of this.) That they might do this voluntarily would speak volumes. That they use excuses and legalese to work the system, well… that is just wrong. I’m pretty cranky about this today. Before I sign off, remind me, on Holy Thursday, who washed the apostles filthy feet?